To see us face to face. T-F noon-7 p.m., Sat. noon-5 p.m., closed Sun./Mon. Times vary based on programming. See our program calendar for days/times we are here. Also open by appointment (email Adam to arrange a visit.). Cincinnati, Ohio 45206 If you need to send something. Use this address for any important mail. e-mail manifest A good way to contact us. subscribe Add yourself to our mailing list and receive exhibit, opportunity, and event announcements by email. You will have the option to select several different topics on which to receive email from us. And you will be able to change or cancel your subscriptions at any time. If you want to speak to someone directly. 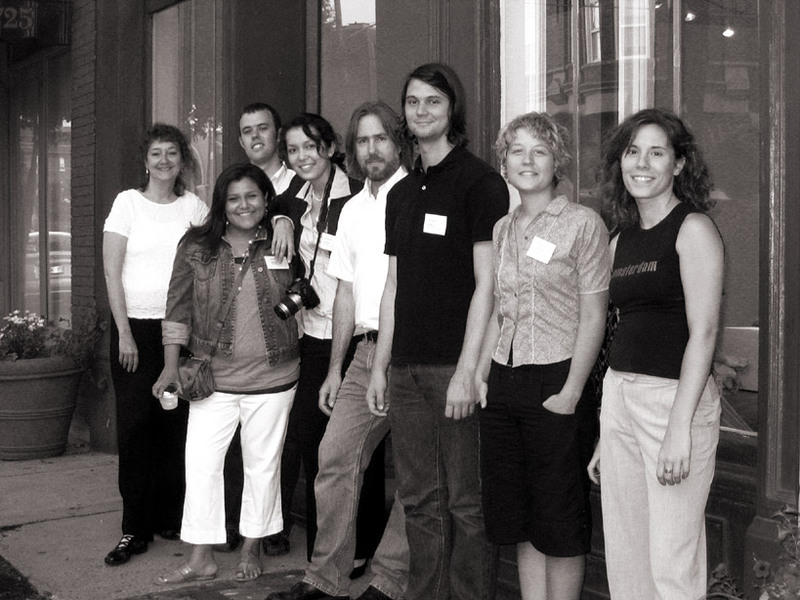 from left to right: Sandi Sharp, Karina Meza, Trevor Ponder, Ai-ling Chang, Jason Franz, Jeffrey Salter, Kate Holterhoff, and Liz Kauffman. Not pictured are Lynda Camp, Kristin Cullen, Alexandra Franz, Kevin Muente, and Brigid O'Kane, and volunteers Katherine Dintenfass and David Jarred.